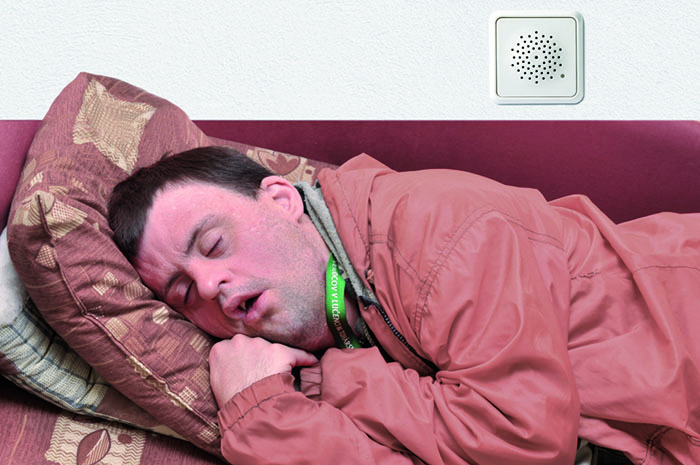 Phillip Moorcraft and Tim Riegman write about an innovative acoustic monitoring system that enhances the lives of intellectually disabled residents by improving care and respecting privacy. Acoustic monitoring can provide a great opportunity to improve the quality of care for people with an intellectual disability. An acoustic monitoring system non-intrusively listens to sleeping residents and triggers an alarm when the sound level in a room exceeds individually set thresholds. Staff monitoring the system only listen into the room once an alarm has been triggered. This enables staff to swiftly respond to residents in need of care. Continuous monitoring replaces routine in-room checks. As a result, peacefully sleeping residents are kept from being disturbed and staff are enabled to focus on attending to needs, instead of looking for them. Furthermore this improvement of night staff efficiency enables care homes to reallocate night staff for better day care. Acoustic monitoring is a proven technology, implemented by many Dutch health and social care homes. One of them is ‘De Zorggroep Limburg’ (DZL) which operates 31 nursing homes. DZL’s Venray location used an acoustic monitoring system to monitor their 100 residents with an intellectual disability. They quickly noticed the benefits of acoustic monitoring over a traditional nurse call system. Before the acoustic monitoring system was implemented at DZL Venray, staff were still actively completing in-room checks every hour. These routine checks proved to be an inefficient means to provide needed care in a timely fashion. Chances of assistance being required in-between routine visits were very high; staff doing rounds often found themselves to be badly positioned at the moment of need. Residents also did not respond well to having their sleep disturbed and their privacy compromised. The implementation of an acoustic monitoring system improved the situation at every level. With intermittent checks on residents replaced by continuous, non-intrusive monitoring of each room, the staff quickly noted that delays in discovering needs had been eliminated. Staff remain centrally located, ready to respond promptly to alerts triggered when a room’s sound from noises such as continuous coughing, crying or shouting exceeds its designated level over a period of time. Residents who are quietly sleeping no longer need to be disturbed unless there is a genuine reason to do so. This has led to improved general behaviour. The acoustic monitoring system promptly and effectively identifies problems and enables more efficient deployment of staff. Staff at Venray noted that specific residents could also be monitored better with little additional effort. With a 50% increase in productivity, the facility was able to reallocate 34% of its night staff to improve day care. The DZL Venray case is an example of one of many care homes that benefitted from acoustic monitoring in various ways. Some of the care homes had experience with using a traditional baby-monitor ‘system’, before making the transition to a professional acoustic monitoring system and they quickly noticed the benefits. Respecting residents’ privacy is of utmost importance. Therefore, appropriate usage procedures must be established and adhered to. In-room indicators (visual and/or audio) can be used to let residents know when they are being monitored. When explained correctly to them, clients and their peers welcome the use of this system, as the residents are no longer needlessly disturbed during the night. To conclude, an acoustic monitoring system improves the overall experience for residents, families, staff and management. Residents are no longer disturbed needlessly during the night, which improves positive behaviour during the day. Staff are able to monitor all residents continuously and only respond to actual issues. Their efficiency increases notably, which pleases the management. In turn, management can reallocate more staff and funding into improving day time facilities, which pleases both residents and their families. Families have piece of mind knowing their loved ones have an innovative solution that ensures if any issues arise during the night time they will be dealt with in a timely manner. CLB specialises in the development, production, installation and service of innovative integrated communication and alert systems to hospitals and care homes. Its solutions help support staff to improve care quality, provide greater privacy for residents and help to reduce operational costs. Established in 1981, and based in The Netherlands, CLB’s reputation is built on its extensive experience within the health and social care sectors, as well as other industries, government and public sectors.